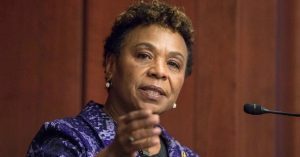 To the surprise of many, Rep. Barbara Lee (D-Calif.) provided the winning margin in the House Budget Committee last week when she voted for a bill that would raise military spending by $17 billion next year. Some prominent constituents of the famously antiwar congresswoman are now vocally questioning her pivotal action. See recent piece — “Rep. Barbara Lee’s Startling Vote to Boost Military Spending” — by Norman Solomon, co-founder of RootsAction.org and founder and executive director of the Institute for Public Accuracy.